Made in rounds without turning - With colour 1 make 5ch, ss to first ch to form a ring, 3ch, work 11tr into ring, ss to top of 3ch on beginning of row. Round 6 - Join in colour 1 with a ss to top of 3ch, make 1ch, 1dc into base of 1ch, 1dc into each 1ch space and tr to end, ss to first dc. Round 8 - ss to first 1ch space, make 3ch, 2tr into same space, work 3tr into each 1ch space to end, ss to top of 3ch. Fasten off. 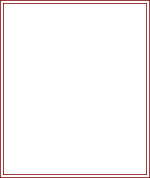 Round 11 - Join in colour 1 to first dc, 3ch, 1tr into each of next 2dc, * 2tr into next dc, 1tr into each of next 3dc, * rpt from * to * to last dc, 2tr into last dc, ss to top of 3ch. Round 12 - 1ch, 1dc into base of 1ch, 1dc into each of next 2dc, * miss 1tr, work (1dc, 2ch, 1dc) between next 2tr, 1dc into each of next 3tr, * rpt from * to * to last 2tr, work (1dc, 2ch, 1dc) between last 2tr, ss to first dc. Fasten off. Finishing - Weave in and trim off loose ends. 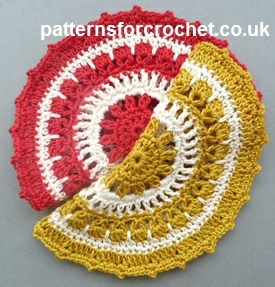 Hope you enjoy this free crochet pattern for a round dishcloth.